Toni Bou shone once more in Barcelona. Twelve victories of the Montesa rider in their honours list. The legendary Palau Sant Jordi arena today hosted the fifth round of the FIM X-Trial World Championship and witnessed the rampant Repsol Honda Team rider outclass the opposition. Takahisa Fujinami finished sixth. 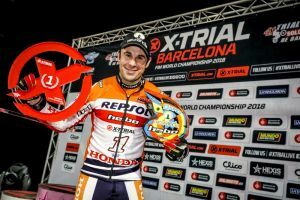 Repsol Honda Team riders Toni Bou and Takahisa Fujinami today tackled the fifth date of the X-Trial World Championship calendar in Barcelona. After the previous four races, which had all been held in French territory, indoor trial’s top venue saw Bou back on Spanish soil in front of a home crowd. The champion dominated throughout the entire competition. In the qualifying phase, Bou, in spite of not scoring the highest result, nevertheless showed some gutsy resolve, collecting just a single error in one of the sectors. In the following semi-final phase, where only the top rider from each group of three would make the cut, Bou showed few signs of difficulty as he cruised into the next round. In the final head-to-head, with the crowd firmly behind him every inch of the way, Toni Bou proved once again to be the most on-form rider in the indoor discipline. Bou wrapped up his fifth consecutive victory with a six-point advantage over his arch-rival Adam Raga on the day, extending his advantage in the overall X-Trial World Championship standings to thirty-one points. Takahisa Fujinami, wild-card rider, finds his way into the second phase of the race but several crashes don’t permit the Japanese rider a best result than sixth at final results. The next event of the FIM X-Trial World Championship will be held once again on Spanish terrain. Seville’s Palacio de Deportes gets to host the trial on Thursday, March 8, the sixth round of the championship which could see Toni Bou mathematically seal a twelfth world title.